A delicious French toast, made with croissants and served with a strawberry compote, this unusual and delicious variation on French toast is really a winner. Melt 1 tablespoon butter in a large nonstick skillet (or griddle) over medium heat. Add four croissant halves, and cook about 2 minutes on each side or until puffy and golden brown. Repeat procedure with remaining butter and croissant halves. 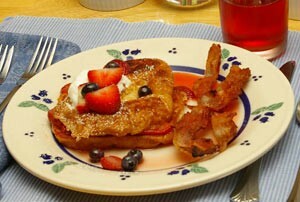 Sprinkle with powdered sugar; top with Whipped Cream if desired, and Fresh Strawberry Syrup. Serving Ideas : Sprinkle a few blueberries on top for a colorful presentation. NOTE: If croissants are not stale, they will not absorb the batter as fully, and will not plump as much when cooked.